Welcome to Latto Maintenance Ltd. Established in 1879, Latto's in one of the longest running businesses in the Clydebank area. Serving both housing associations and the general public we offer high quality building services with a name you can trust. 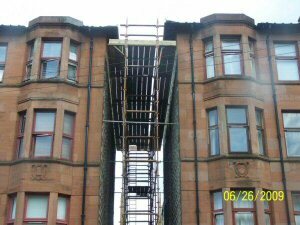 Whether you are looking for scaffolding services, lead work and gutetring or there is a serious issue with building security then Latto's can help. We take health and safety very seriously, both for the public and our workmen. We always appraise the risks of each job individually and never start a job without first making sure we are compliant with all regulations and best-practices.